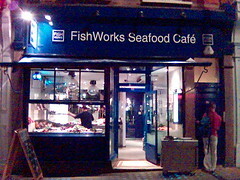 Had a very nice meal tonight in Fishworks on Marylebone High Street. It was doubly nice as it was a free meal given in response to a really bad one we had had there some time ago. Everybody fucks up once in a while but not everyone recovers the situation as well as they just did.